Durga Navaratri, or the nine (nava-) nights (-ratri) of Durga, are celebrated in the first 9 days of the bright half of the month (starting from the day after Amavasya) of Aswayuja/Asvina in the Indian lunar calendar (usually in end of September or early October). This period of nine days (October 3rd – October 12th, 2013) is the beginning of the festival season in all parts of India as the period of Navratri concludes with Dasehra (or victory day or Vijaya-Dashami) on the tenth day of the festival (October 13th 2013). The nine-day festival honors the role of three prinicipal female Goddesses in the Hindu pantheon – Durga, Lakshmi and Saraswati. The story of Durga that is most frequently associated with Navratri is the incarnation of her as the slayer of the buffalo-headed demon or asura, Mahishasura. A long war had been waged between the gods, led by Indra, and the anti-gods. The king of the anti-gods, the genie Mahisa (the Powerful), won the war and established himself in heaven. The gods wandered homeless on the earth. Then, guided by Shiva and Vishnu, they concentrated their power into the shape of a goddess named Durga (the un-reachable one). The power of Shiva formed the head, that of Yama the hair, that of Vishnu the arms, that of Indra the waist, that of Brahma the feet. All of the Gods handed over their weapons to the goddess Durga. The goddess chose a lion as her vehicle, and defeated the armies of the anti-gods In her final battle, she fought the demon MahisaII, who took on many shapes to fight her, and finally that of a buffalo, the symbol of death. Durga pierced the throat of the buffalo and restored the heavens to the Gods. 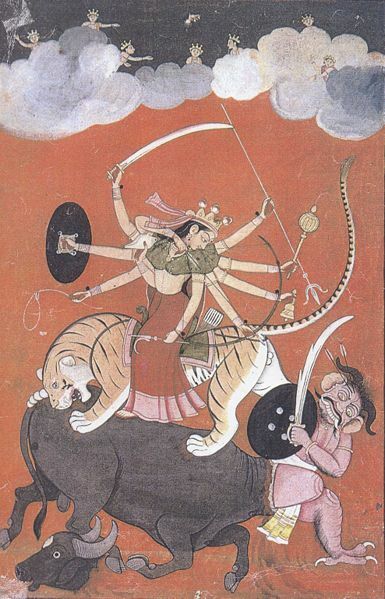 Hence, Durga is often referred to as Mahisasura-mardini, the slayer of Mahisasura. yā devī sarvabhūteṣu viṣṇumāyeti śabditā . namastasyai namastasyai namastasyai namo namaḥ ..
We bow to your majesty again and again. Please bless us. Tell us about your Navratri celebrations in the comments below. Thank you for reading and sharing. The stories connected with every festival has kept the traditions alive and vibrant for more than five thousand years. Is it not a gift of our civilisation?